June 26 , by Mardi Robyn. I know I have posted many tutorials in the past few weeks for friendship bracelets, but what can I say, besides they are a popular trend. It is fun for me to think about friendship bracelets were popular when my older sisters were teens. I am several years younger than they are. I remember their friends would make them friendship bracelets and my sisters would tie them around their blue jean purses when they weren’t wearing them around their wrists. This tutorial is adds something extra to the standard friendship bracelet, rhinestones! 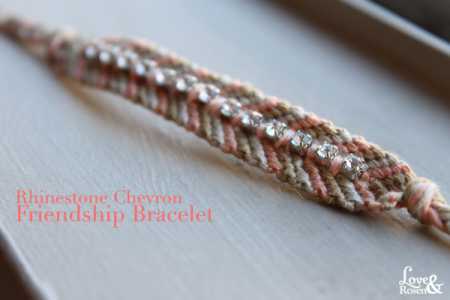 Arica from Love and Rosen provides detailed instructions, and photographs to help you create your own Rhinestone Chevron Friendship Bracelet. Learn how she made this neutral colored friendship bracelet, and make one for you and your friends!